What would a Museum be without the people that visit it? How would all these treasures shine if not through the eyes of all those that behold them? A Museum lives, and dies, by the will of the public. In this expansion, you and your friends can battle it out for public acclaim as well adding a 5th player to your games of Museum! In The People’s Choice, you’ll be competing for a common objective that is drawn at the beginning of the game. For example: The “B.C.” card awards players with the most BC dated cards in their museum. The player with the most cards takes the People’s Choice token and keeps it until another player amasses a bigger collection. 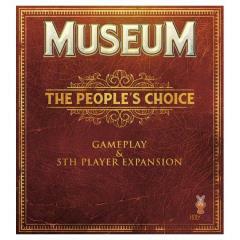 Additionally, by public demand, this expansion also includes the necessary material to play Museum with up to 5 players! This includes a Museum board and tokens for the base game, as well as all the elements necessary to play each of the expansions with up to 5 players.